Blood Stone 007 is an action-adventure video game, developed by Bizarre Creations and published by Activision for the PlayStation 3, Xbox 360, Nintendo DS, and Microsoft Windows platforms. It is the 23rd game in the James Bond series although it is not a direct sequel to any game; it is the first game since Everything or Nothing to have an original story. The game was confirmed by Activision on July 16, 2010. The game was released on November 2, 2010 in North America and will be released on November 5, 2010 in Europe. Activision's GoldenEye 007 (2010) will be released on the same day. Blood Stone features the voices and likenesses of Daniel Craig, Judi Dench, and British artist Joss Stone. The game is a third-person shooter with elements of hand-to-hand combat. Some elements from Quantum of Solace were removed such as the cover to cover system. There are some driving sequences. Blood Stone features a unique Focus Aim system which allows players to lock onto targets after melee takedowns, not too dissimilar to the "Mark and Execute" feature from Splinter Cell Conviction. 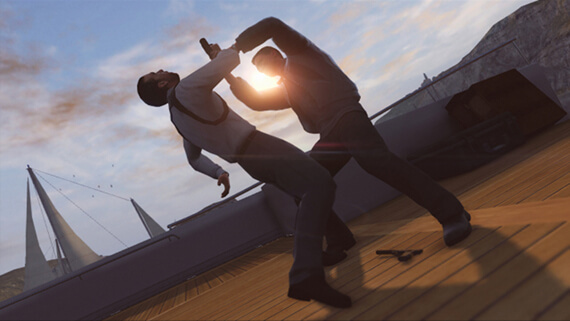 There is also a multiplayer mode consisting of up to 16 players that will pit spies versus mercenaries. Alongside team deathmatch and other standard game modes there are massive objective-based battles where players have to work as a team to attack or defend various spy-themed goals. It has also been announced that players will pilot a number of vehicle types throughout the course of the game.